SELF HELP is only a click away. Our sister site includes our database of 13,000 VA and Community resources to help you to your best life after deployment. Below is what it looks like. Choose one of the three options. No matter what you choose you will only be a click away from the help of an advocate, if you would like one. By clicking on any field in the Self-Assessment chart, you will see descriptions and helpful links for that issue. By clicking next to the named fields you will get an output you can take to the VA to be immediately referred to appropriate specialists. 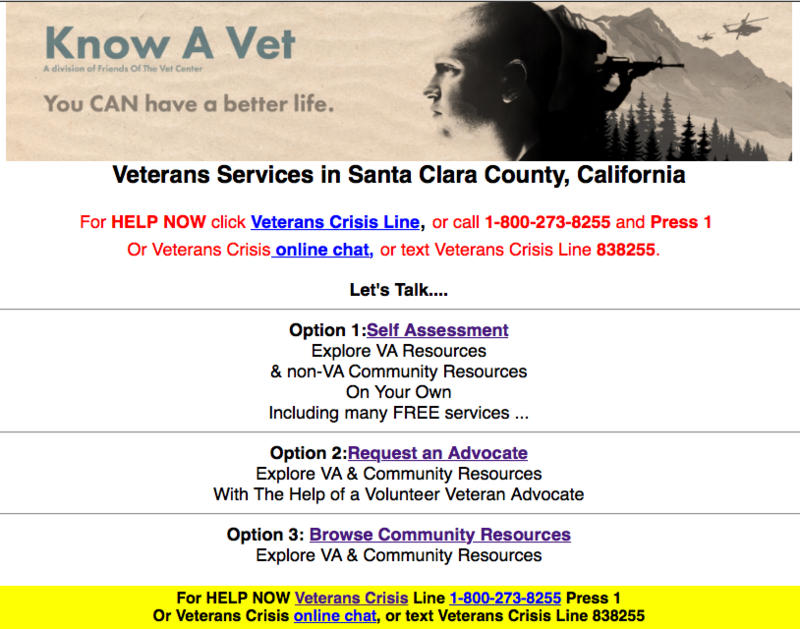 Or you can search for Community help, outside the VA, and finally, you can click for an advocate and one of use will help you through the process of deciding what you want and how to get it. If you are not yet enrolled with the VA, for medical or compensation purposes, we strongly suggest you do that. While you can walk into any VA hospital and start the process, we recommend that instead, you start with your local Veteran’s Service Organization. These are county offices that will do the paperwork for or with you and advocate for you to the VA, insuring you get the highest level of compensation and care. They offer free, confidential support 24 hours a day, 7 days a week, 365 days a year. NEED HELP – BUT NOT A VET? Click to see what you can do.